We got rain! We got rain! Whoopie! This was a pretty big deal here in SoCal because we've been in the middle of a drought for a looooong time. Since I love trying easy art projects with Chuck, we took advantage of the rain and collaborated with Mother Nature to create some beautiful rainy day process art. 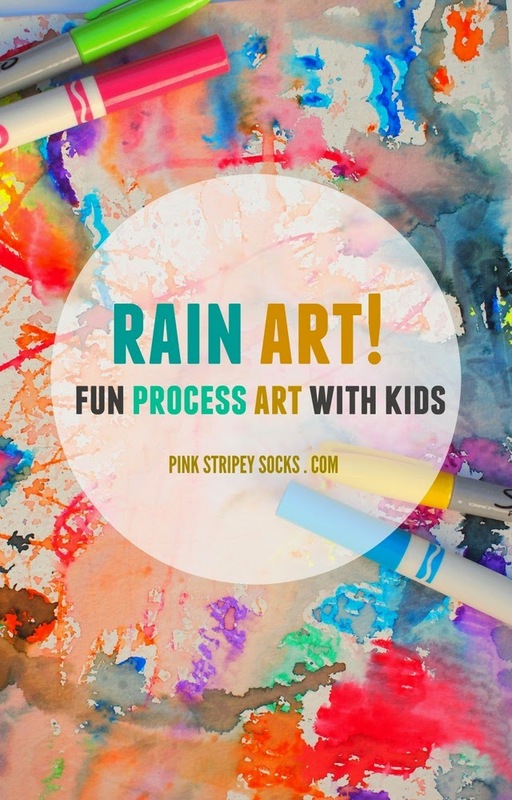 Let's Make Rainy Day Process Art! This was a really fun and easy art project. I really enjoyed it because we didn't concern ourselves so much with the final product. Instead, we just really enjoyed making art together and then watching Mother Nature add her bit too. Here's how we made our rainy day process art! Since becoming involved with the Kid Blogger Network earlier this year, I've been introduced to a ton of wonderful new blogs and this new idea called "an invitation to play." 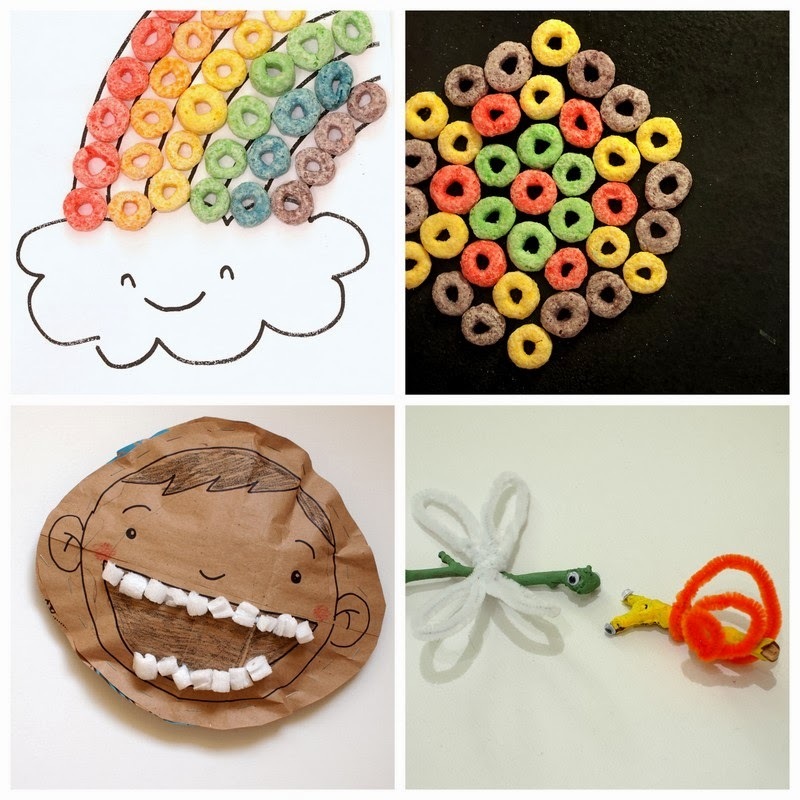 Basically, you provide the child with several objects and inviting him/her to explore the materials. I love this idea because there isn't a pressure for kids to perform. They get the opportunity to be curious, explore, play, and have fun. So, after seeing this shaving cream activity on the Hands on as we grow blog, Chuck and I tried our own shaving cream play... but with an added twist... water balloons! Let's Play with Shaving Cream and Water Balloons! If your kid likes messy play, baked goods, and facial hair, then this is the activity for you! Let's get playing! How are you enjoying this snowy weather? Since Chuck was sick, we stayed inside. But, the snow was just too tempting, so I let him play with it inside the apartment. Currently there are so many blogs showcasing indoor snow painting, but this one from Housing a Forest really inspired me to do this activity. Keep reading to see our artwork! Oooh. Circular rainbow! I just think it's so cool that the blades are painted different combinations of red, yellow, or blue. Yon can only see the rainbow when the fan is turned on. Whoa, right? Last weekend, I made these rainbow flowers. Wanna bring some rainbow cheer into your life? They're easy to make. Plus, you get to see science at work. So... what's a cooped up mama and 16 month old baby to do? Rice krispy treats are my new favorite dessert. They're perfect for satisfying my sweet tooth, super easy to make, and they're wheat/soy/nut free! Score! This Sunday our church held it's monthly potluck and of course, I really wanted to bring them. Since I already brought them to the previous month's potluck (I told you they were my favorite dessert), I figured I should probably shnazz them up. That's when I thought to make some St. Patrick's day themed rice krispy treats. Oooh. To make them, I tweaked the basic rice krispy recipe. After melting the marshmallows, I divided the goo into 6 different containers. Then, I quickly added food coloring into each of the containers (red, orange, yellow, green, blue, and purple.) Hubby quickly followed behind and stirred the food coloring into the melted marshmallows while I added rice krispies into the mixture. It was crazy. I felt like Lucy, rushing to eat the chocolates off the conveyer belt. Hubby was mixing, I was mixing, rice krispies were falling onto the floor, the marshmallows were hardening a little too quickly, and in the midst of it all we actually broke a spoon. Ooooh. Here I am slicing a colorful ricey log. Looking back, I probably should have just made one color first, then made one layer of colorful rice krispies, and then moved onto each of the following colors. The layers would have been neater and things wouldn't have gotten so out of hand. Oh well, there's always next time! Special thanks to hubby for being a good sous chef. To see my Academy Awards rice krispy treats, click here.